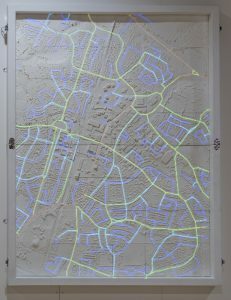 The School of Creative Arts at the University of Hertfordshire has used 3D printing digital data to create the first 3D printed landscape map of Welwyn Garden City. The map can be used as a planning tool by projecting social, cultural and economic data over the map itself. It can also show the impact of new developments. The process creates a physical model in which large geographic regions can be printed and visualised. The prototype emerges from research into Garden Cities and UK New Towns and its landscape space over time. To create the model, Light Detection & Ranging (LiDAR) Data of the city has been captured using an ALTM Gemini LiDAR sensor. The data has been processed and ‘solid modelled’, as well as being hollowed out. Each print tile represents a National Grid 250m2 square. This could be the start of a revolution in 3D printing and mapping. The use of unmanned aerial vehicles, car mounted scanners and hand held devices mean that data capture and production is likely to be streamlined further. This could lead to the creation of ever higher fidelity models – deepening our understanding of the impact of development and a changing environment.